Do you find yourself wondering “What is a Chief Financial Officer?”Are you interested in becoming a top-level executive who is in control of a corporation’s finances? If you answered yes to these questions, it is time to find out about the roles and responsibilities of CFO’s. Students who ask CFO’s, who are currently in charge of the financial operations of a corporation, may be in for a four-hour long conversation. Luckily, you can skip the long and dull conversation and find out about the core duties of a Chief Financial Officer by simply reading this article. Chief Financial Officer’s must review past financial statements and reports to make decisions that are best for the future. The controllership duties of a CFO involve reviewing and presenting financial statements and reports for accuracy. They are also the key executive in charge of presenting the past financial information to shareholders, investors and financial institutions. While many of the reports are constructed by accounting professionals and the data is gathered by bookkeepers, the CFO is the decision maker and must answer hard-hitting questions about the corporation’s financial past. In addition to presenting past financial information, a Chief Financial Officer will need to forecast the future. The entire goal of a corporation is to make money and to build assets, and decisions that are made by the CFO can help guide a company’s financial future. Reports will show what has worked in the past and what can be capitalized on in the future. It is imperative that executives are strategic thinkers and strategy is very important for financial executives. Forecasting and modeling are just two important components of being a strategist. The best CFO’s think outside of the box, try to predict ways that will ensure success, but still weigh risk. Being a strategic thinker when you are dealing with a company’s finances can be very stressful and challenging. Chief Financial Officer’s will present past financial information and try to predict future financial success, but they must also take responsibility for the current financial position of the company. These treasury duties involve deciding what to invest in, how much to invest, what risks are present, whether or not liquidity is important, and selecting the best types of financing. The best CFO thinks in the now without forgetting about how important decisions will affect the future. While CFO’s are in charge of finance, they may work closely with a CEO when making important decisions that can impact the future. Now that you know about the three core duties of a Chief Financial Officer, you can decide for yourself if this is a role that you would like to play in an organization. As one of the highest ranking professionals in an organization, the CFO must be equipped to deal with stressful situations and pressure from the corporation and the shareholders. According to The Houston Chronicle, CFO’s average salaries of $176,550 per year, but with this high price tag comes a lot of responsibility. 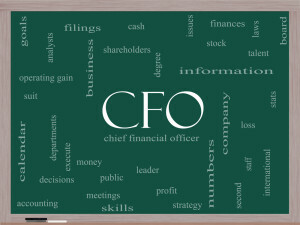 Now that you know what a Chief Financial Officer is, it is time to decide what you would like to do with your degree.